In the early 2000’s, we owned a homebrew shop and one of the perks was attending a yearly home beer & winemaking conference. The trade association usually picked pretty cool cities to host the conference and one year it was held in Vancouver Canada. This was one of our first international trips and our first exposure to the beauty of Canada. When the Radisson hotels asked us to be a part of their Discover Your Canada campaign, I immediately started reminiscing about our fabulous trip and thinking about the reasons my husband needs to take me back to Vancouver Canada again! Hint, Hint – Make sure to read to the bottom to enter to win a Radisson e-certificate giveaway good for one night stay from our sponsor Radisson Hotels! From the downtown city skyline, miles of water views and the mountains surrounding Vancouver, there are picture perfect scenes everywhere you look! Outdoor enthusiasts will enjoy easy access to mountain biking, hiking, golfing, fishing, and tons of other outdoor activities. In the winter, there are several snow skiing options within a 15-30 minute drive from Vancouver. Whether you like fast paced nightlife or leisurely strolls by the water, we found Vancouver to be very walkable and enjoyed exploring neighborhoods such as Chinatown and Gastown (the original town site of Vancouver). There is a neighborhood for everyone’s taste! In fact, walk score has named Vancouver the most walkable large city in Canada. The one thing I remember most about our trip to Vancouver is picking up a love for Salmon. Prior to our visit, I would have told you I didn’t like Salmon. What I learned was, I didn’t like Midwest salmon. There is nothing like enjoying fresh caught Salmon during Salmon Season in Vancouver. We were dining at a wood fired restaurant on the waterfront one evening and our server talked me into trying their cedar plank grilled salmon special. This meal was truly a turning point in my culinary life. Before we left Vancouver, I enjoyed Salmon “100 different ways” and I highly recommend visiting Vancouver during Salmon season. You don’t have to be a Salmon lover to enjoy the culinary scene in Vancouver. There are hundreds of great restaurants, fresh seafood year around, breweries, brewery tours, food trucks, casual and upscale dining. In Chinatown you can find some of the best dim sum around. Vancouver is a foodie’s delight. Vancouver is filled with historical sites and landmarks. As mentioned above, Gastown is the original town site of Vancouver. Here you’ll find cobblestone streets, historic brick buildings, and an antique steam clock. This is one of the few functioning steam clocks in existence. In the mid 1800’s the owner of a pub installed a steam clock to draw attention to his establishment. The pub quickly became known as steam clock tavern. Today a replica stands in the area with a steam driven whistle and electrical powered clock. Vancouver also features many other historical sites and districts such as Stanley Park, Chinatown, and Library Square. You’ll enjoy hundreds of old architectural buildings throughout the city with influences from various cultures and building styles. The Radisson Hotel Vancouver is conveniently located just 6 minutes from the airport. 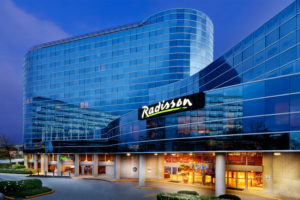 The Radisson Vancouver offers free shuttle to and from the airport and features an indoor pool, Fresh Restaurant & lounge, and apartment suites for those looking for a longer stay. Hop on the Canada line at the Aberdeen Station located across from the hotel and head into Vancouver. With easy access to local transportation including bus, ferry, & train, you can explore on your own terms. Or ask the hotel to set you up with a local tour. We especially love Radisson’s flexible 6am check-in and 6pm check-out policies. This makes a world of difference when arriving early at a destination with little kids. During Radisson’s Discover Your Canada Campaign you can receive up to 20% off your stay at the Radisson Vancouver (or your stay at other Radisson hotels in Canada!) Book your stay today! WINNER: Pam (Comment #52) Randomly selected by Random.org Number Picker. Thank you to everyone who entered! We are hosting a Giveaway for a one night e-certificate to ANY Radisson in US or CANADA. To enter the Giveaway: 1. Sign Up for Our Newsletter if you haven’t already (upper right hand corner or popup box) and Like our Facebook Page 2. Visit http://Radisson.com/StayCanada rel=”nofollow” 3. Comment on this blog post below. Good Luck! *Sharing is Caring! Please share this Giveaway with your friends and followers on Social Media using the share buttons to the left or the top of the post! Thanks in advance! *Winner will be drawn at random from the comments after October 3rd. All reservation and certificate information will be handled by the Radisson hotels. Some restrictions may apply. Must be 18 or older. Void where prohibited. What are you waiting for? Plan your Canada Vacation today! Many thanks to Radisson for sponsoring Today’s Post and inspiring me to getaway to Canada! I’m ready for my husband to take me back to Vancouver! Schaake wouldn’t mind all the hockey related activities too! I have never heard of those check in / check out policies before. Fabulous. We’re a fan of the early/late checkout for sure! I’m from Vancouver, though I’ve been gone many years.. your pictures remind me of how much I miss it! I’d love to win a free night stay. I would take my husband and sneak away from the kids. That does sound fun! Good luck! I would like to visit Vancouver, it looks so nice. Wow! This sounds great. I’ve never been to Canada and have often thought of going, just didn’t know where to start. Vancouver seems to be a wonderful place. The food looks amazing. I have stayed at a Radisson Hotel before, so I know that is always a pleasure. Thanks for the fantastic information. Can’t wait to plan my Canada vacation! I love Canada, every inch of it. Itès awesome that there are so many Radisson locations to choose from. Thanks. I am already a subscriber to your email. They have the best check in and out policies! My husband and I never get a kid free night so that would be amazing! Thanks for the chance. What a pretty area. I’ve never been and wouldlove to see it. awesome post, i love western canada! This would be perfect for my husband and I. He has been working really long hours the last few weeks. Thank you for this giveaway. Good luck for your both! I hope you get a night away. I would love to go back to Vancouver. I live a few hours away and it is an incredible city! So beautiful. I subscribed and checked out the link, hope to win a vacation! Thanks! wowzers!! i’d love to win this!! Id love to win a free one night stay! I love Canada and Vancouver was just beautiful. I would also love revisit some other hotspots throughout BC as well. We stayed at the Radisson Harbourfront in Toronto this summer. Fantastic location for all the sights and a great pool temperature at the end of a long day walking! Would love to go back! I absolutely love Vancouver, it’s been way too long since I’ve been there! The Radisson is my favorite place to stay, hands down! 100% because of the convenience factor with transportation, but it’s a super nice place too! I miss Canada. I’d love to go back there again. Never been to Vancouver though. Haven’t been for a few years now. Looks like it is time to get to Vancouver for a lovely trip. I could really use some time away right now! I have always been impressed when I have stayed at a Radisson! I’ve always wanted to go back to Canada with my husband for a honeymoon. Wow, great that Radisson’s Discover Your Canada Campaign you can receive up to 20% off your stay at the Radisson! Love the Vancouver & the perfect place to stay! Thanks for sharing! I think that it’s the most beautiful city I have ever been to. Love the early check in/check out. Definitely a huge perk when travelling with kids! OMG! Those check in/check out options are amazing! Kudos to Radisson for their great new policies! As a Mama of three with 2 under 2, I could DEFINITELY use a night out with hubby (and the baby since I am EBF)… Thank you for the chance. Our Crowne Plaza downtown used to be a Radisson . . . I have stayed there many times for weekend giveaways. If I win I will go somewhere nearby all alone and have a little time to myself! My neighbor just told me about her trip to Vancouver…I would love to visit, and I’m wishing on a star to go there! Radisson definitely looks like a great place to stay. Thanks for the giveaway! subscribed, liked on FB and would love to visit Canada! We will be using a random number generator to pick the number of one of the comments on this post. Good Luck! Would love to use this thanks for the giveaway. Love the check in policy, very refreshing! I have never been to Canada, but I would love to visit! I honestly have never been to Vancouver, would love a chance to experience it. It is my dream bucketlist. I have never been to Canada. I am a subscriber and facebook fan and I checked out the Radisson page. I have never been to Vancouver & it’s one of the top Canadian destinations I want to visit! I would use the gift certificate though to stay at the Radisson Ottawa Parliament Hill location so I could visit my grandparents & take a tour the parliament buildings! I am a Carlson Club member and love Radisson Hotels. Thanks. I’m ready for a family vacation in Vancover! I love that steam clock. Magnificent – it reminds me of Big Ben, here in London. I’ve never been to Vancouver but I’m a huge fan of salmon so I really should go! I have never been to Vancouver but heard so much about it. Your post makes me want to visit even more this city that has so much to offer! I’d love a chance to win! THe RADISSON HOTEL & SUITES FALLSVIEW, ON looks amazing. thanks for the chance. The Radisson is a great place to stay. We had the chance to stay in one during our stay in Luxembourg. And I hear Vancouver is a wonderful place to visit! We’ve been there 3 times so far. My favorite city in North America, especially during the Winter. Would love to stay at the Radisson while there in January 2017! This would be awesome to win so I could plan a weekend away. Completed all steps required for entry eligibility….thanks for the chance! Woo hoo a free night at the Radisson! Hubby would love this. Beautiful hotels! Love the extra early check-in and late check out. So many great choices. We are from Michigan so definitely are close enough to visit our neighbor of the north. I would love to visit Toronto. I’d love a trip to the north shore this fall up near Lake Superior. Vancouver looks lovely, thanks for the chance to win a stay! Love the extra discounts from Radisson! We stayed this summer at their Toronto Harbourfront location! Great views and perfect location for touristing! I would like to go to the Radisson in Kenosha, WI. Done all three steps! Would love to stay at Radisson in the states when i go visit my friends there. I am signed up for your newsletter, I follow on Facebook as Angela Saver, & I visited the Raddison site! Thanks for the chance! Yes please, take me back! I have needed a night out since the death of my son to SIDS 4 years ago. I would love a night at any of your amazing vacations! I am following on facebook as Casey Garvey and signed up for email.